Posted on November 6, 2013 at 10:30 am. Let’s clear things up and apologies for sounding like a teacher, but for those who don’t know, a landing page is NOT your web site’s home page. Your landing page (sometimes referred to as lead-capture page) is a single web page that appears when a search engine optimised search result, an online banner ad or a link to a download is clicked. The general goal of a landing page is to convert site visitors into sales or leads. In fact, it can generate a 5-15% conversion rate on average. Specifically, the job of a landing page is to tell your visitors exactly what you want them to do. It’s not (as home pages do) to give them free range to meander through your website. So do you actually have a landing page and does it deserve perfect marks? Most importantly, a form on the landing page itself to capture information. If for some reason you can’t include a form on the landing page, use a large call-to-action button to direct visitors to the next step. A landing page is used for one purpose and one purpose alone – to encourage a visitor to take one specific action. When visitors land on a page, we want to keep them there until they perform that action. Don’t encourage them to wander. This is a BIG mistake made by some companies. Don’t try to stuff too much information on your landing page. Make it clear what the page is about and what you want the visitor to do. Limit the amount of copy, images, media, and links to only what’s necessary. It’s especially important that the call-to-action is as crystal clear as possible for the visitor. Remember: the MORE you put in, the LESS they take out! But these are only three top tips. 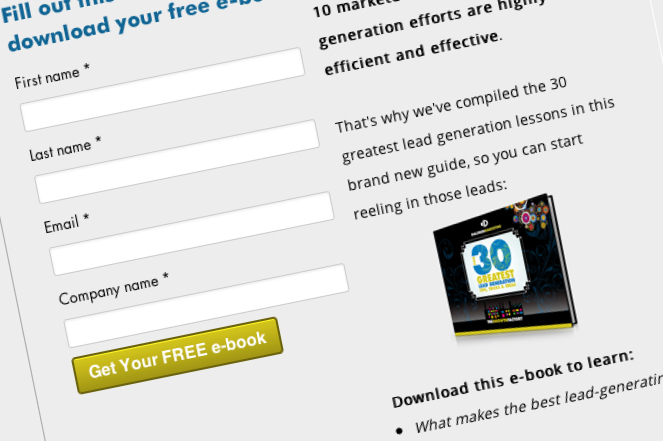 For the FULL lowdown on how to increase your business leads, simply click below to download Dialogue Marketing’s e-book on ‘The 30 Greatest Lead Generation Tips, Tricks & Ideas’ where you’ll click through to – guess what – the perfect landing page!